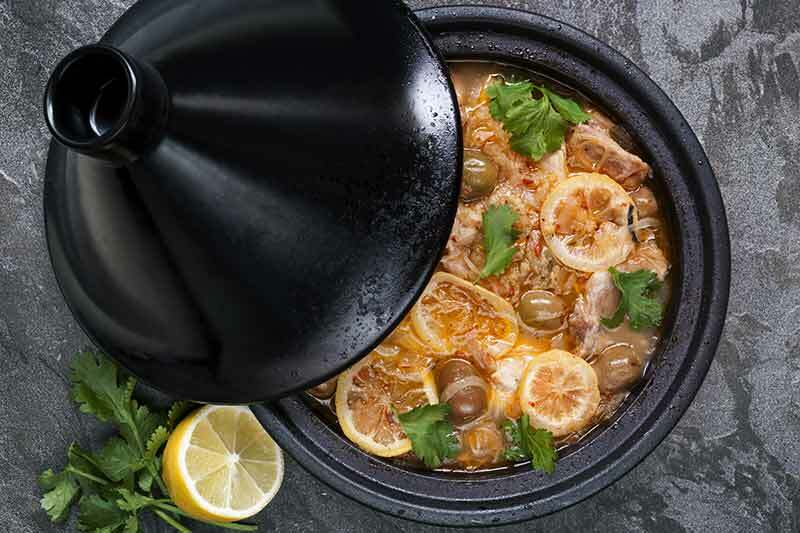 A great tagine made with chicken and with a little added flavour and spice from the keralan lemon pickle. Soak the saffron in the warm milk. In a tagine or heavy-bottomed pan, heat the olive oil and fry the onions until soft. Add the cumin, cinnamon and garlic then fry gently for 2 Minutes. Place the chicken pieces into the tagine and stir everything to coat the chicken. Next add the Keralan Lemon Pickle and saffron in milk plus the chicken stock and bring to a simmer before lowering the heat and covering for 50 Minutes. Put in the olives and simmer for a further 8 Minutes. Add the chopped herbs prior to serving. Serve with fluffy cous cous, flat breads or bulgur wheat.